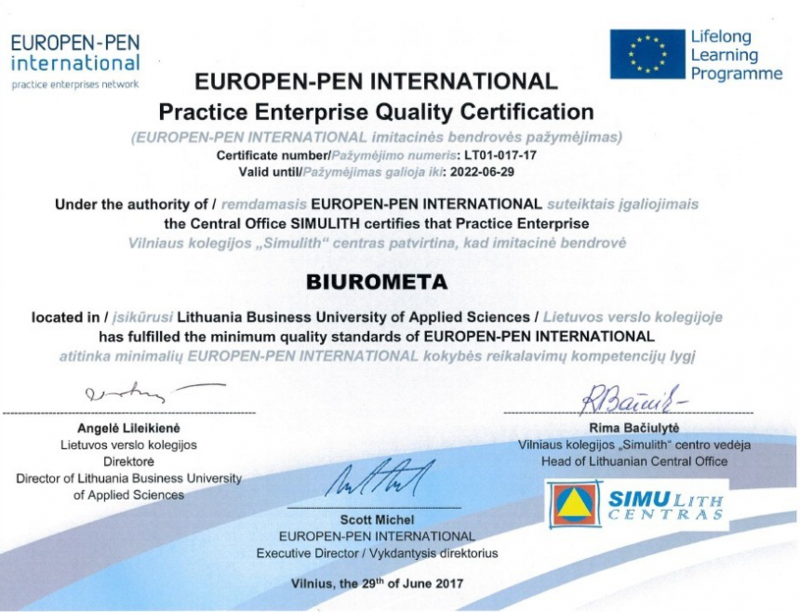 Practice Enterprise (PE) Biurometa has been a member of the Simulith Center and the international organization EUROPEN, which co-operates with PE since 2005. PE is a company that imitates the activities of real companies and markets them through the Simulith Center in Lithuania and the EUROPEN network in the world. The PE "Biurometa" staff and department heads are Lithuanian Business College students who practice internship in a business practical training company. Students work in different PE divisions and simulate real-life economic and financial activities, have access to real documents, realize their ideas and plans, acquires practice in a business company, cooperates with other Lithuanian practical training companies. PE „BIUROMETA" ⋆⋆⋆⋆ Imitation hotel. OBJECTIVE OF THE FIRM: Excellent service quality, improvement of the supply of various services and customer attention. MISSION OF THE FIRM: Give the most wonderful moments to our guests' memories. VISION OF THE FIRM: A leader position in providing quality services. Our credo: YOUR NEEDS - OUR CONCERN!